Beranger is 17 months old and probably the most active little boy in the program. Today at the milk distribution, he was walking around and exploring everywhere. His aunt who takes care of him, Alida, could not keep up with him! At one point, we found him with his hands in the box of milk, trying to pull out the cartons. “Somebody is anxious to get their milk!” Rebeca, the responsable of the Infants in Distress program, said. Beranger entered the infants in distress program after his mother died from postpartum complications ten days after his birth. His father, a cultivator, is still alive, but caring for the orphaned infant often falls to the closest female relative – in his case, the father’s sister. When she was asked to care for the child, she admitted that she was reluctant. “But if I don’t accept the child, will he live?” she asked herself. She attends the Evangelical Church of Christ (Église Évangélique du Christ, EEC) in her village, through which she learned about the infants in distress program that collaborates with our EEC church movement. 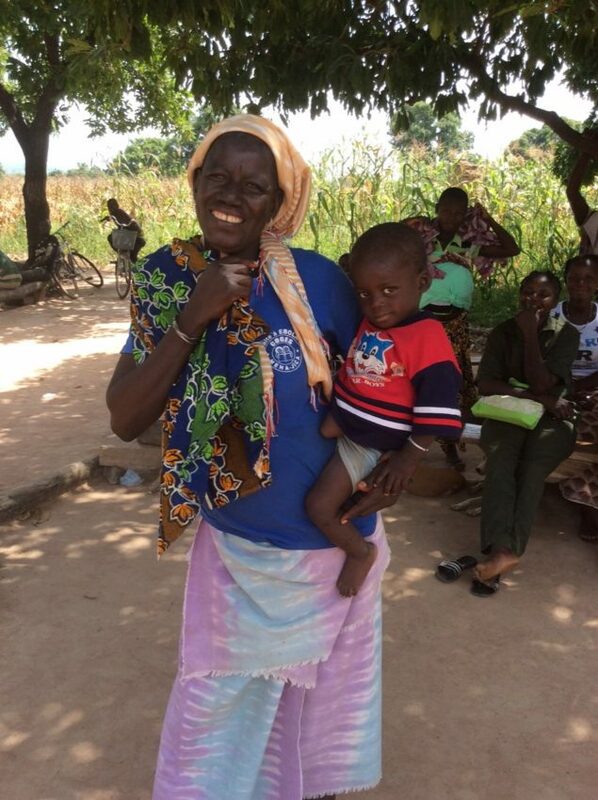 She came to the Stream Team village to enroll the child, and he has been thriving ever since. In July, he had an incident and came into contact with boiling water that left second degree burns on his left arm, face, and neck. The infants in distress program intervened and provided for his medical care, and two months later the burns were completely healed! I couldn’t believe it was the same child when I saw him! In an environment where burns and wounds become easily infected and take a longer-than-average time to heal because of poor nutrition, his complete healing in two months is truly a miracle! As Alida recounted to me Beranger’s story, she finished by saying, “The God to whom I pray is the God who saved the life of this child.” She rejoices in the reality of the presence of the true God to whom she prays. Sometimes families in desperate situations wonder if God is real and if he hears them when they pray. That’s when the Infants In Distress Program gets to open the door into their lives and hearts to show them that he is the true God who hears their prayers, loves them, and will never abandon them. Thanks to your prayers and support of the infants in distress program, many lives like Beranger’s and Alida’s are being touched with the love and good news of Jesus.